You can also download the entire Coriolanus translation as a PDF! In 491 BC, during a massive a grain shortage, Roman citizens riot. An old senator, Menenius, tries to calm them. In Antium, Tullus Aufidius gets orders from the city's senators to defend a city called Corioli from the Roman army. While Marcius is at war, his wife and mother discuss his fighting as well as his son at their estate in Rome. A huge battle at Corioli. The fight turns against the Romans, and rather than flee, Marcius charges into the city. After singlehandedly winning Corioli, Marcius argues that they should run to help Cominius fight nearby. Cominius, amazed at Marcius's bravery, welcomes him at another battleground. Marcius rallies the Romans again. Nearer Corioli, Titus Lartius is marching to join Marcius and Cominius. Within the new battle, Rome and Antium's two best fighters—Marcius and Aufidius—begin a deadly duel. At the end of the battle, Cominius and Marcius talk over how it went. Cominius praises Marcius, Marcius humbly resists. Aufidius and his men limp home, defeated. Aufidius swears vengeance on Marcius. Marcius (now Coriolanus) returns to Rome, amid heated discussions of his honor and the future of Rome. The Roman Senate discusses whether Coriolanus should become a consul, the highest elected office in Rome. Roman citizens debate supporting Coriolanus. When he enters, they speak with him and lend their support. Tribunes plot. Roman tribunes claim the people have rejected Coriolanus. A huge debate in the senate nearly turns violent. Senators, as well as Coriolanus's mother, try to convince him to humbly apologize to the people. He eventually agrees. Tribunes assemble a crowd, and accuse Coriolanus of treason. Things instantly turn violent, and Coriolanus is banished. Coriolanus's family and supporters see him off at the gates of Rome. The Tribunes encounter Volumnia, Coriolanus' mother, who verbally tears them to pieces and vows hatred. News reaches the Volscians that Coriolanus has been banished from Rome. Coriolanus comes to Antium disguised, looking for Aufidius. Coriolanus enters Aufidius house during a feast, debates with servants, and meets Aufidius, who welcomes him in shock. In Rome, reports begin to filter in that Coriolanus has joined Aufidius and marches on Rome. Aufidius, realizing that Coriolanus is now sole leader rather than partner, plots to bring him down after Rome is won. The politicians debate who will go to try and persuade Coriolanus not to destroy Rome. Menenius agrees to go. Menenius goes to Coriolanus's camp, tries to convince him to be merciful, and is rejected coldly by his former friend. Volumnia brings Coriolanus's family to beg for mercy on Rome. Despite swearing vengeance, he eventually relents. News arrives to Rome that Coriolanus has decided not to attack, and instead made peace between the two sides. Volumnia and Coriolanus's family are hailed in Rome as saviors in a formal procession. Aufidius plots against Coriolanus. In a public confrontation, Coriolanus is stabbed to death for pride; Aufidius mourns. VanWagoner, Benjamin. "Coriolanus Translation." LitCharts. LitCharts LLC, 19 May 2017. Web. 26 Apr 2019. VanWagoner, Benjamin. "Coriolanus Translation." LitCharts LLC, May 19, 2017. 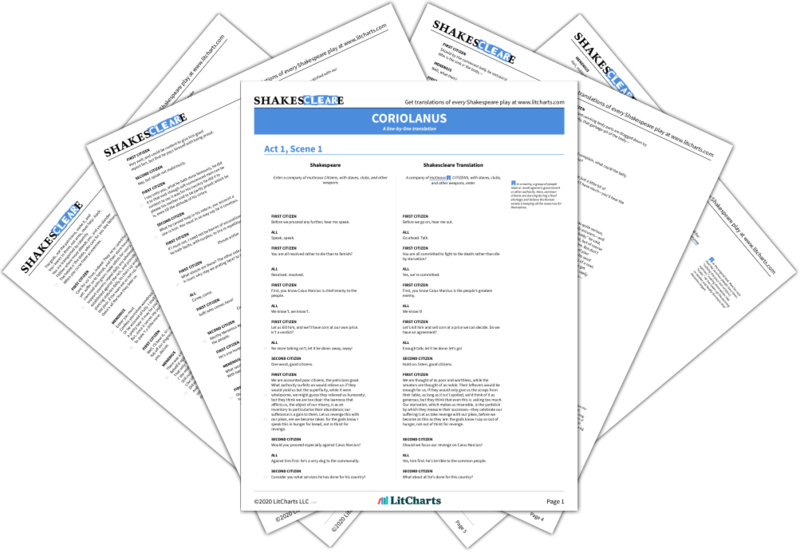 Retrieved April 26, 2019. https://www.litcharts.com/shakescleare/shakespeare-translations/coriolanus.